I confess to not following every detail that emerges about the crisis in Syria, and ask patience from those who have who can bring more to bear in this brief post. Please comment freely. A declassified report by the White House does not divulge all details of the evidence the United States is looking at. And it remains unclear what the “streams of intelligence” cited in the report may be and how they were collected. “We have declassified unprecedented amounts of information, and we ask the American people and the rest of the world to judge that information,” Kerry told lawmakers Tuesday. Physical, “concrete” evidence shows where the rockets came from, when they were fired, and that not one landed in regime-controlled territory, Kerry said. “Multiple streams of intelligence indicate that the regime executed a rocket and artillery attack against the Damascus suburbs in the early hours of August 21,” the White House says in the declassified report. No direct link to President Bashar al-Assad or his inner circle has been publicly demonstrated, and some US sources say intelligence experts are not sure whether the Syrian leader knew of the attack before it was launched or was only informed about it afterward. While US officials say Assad is responsible for the chemical weapons strike even if he did not directly order it, they have not been able to fully describe a chain of command for the 21 August attack in the Ghouta area east of the Syrian capital. It is one of the biggest gaps in US understanding of the incident, even as Congress debates whether to launch limited strikes on Assad’s forces in retaliation. US and European security sources say this unit was likely involved in mixing chemicals for the 21 August attack and also may have played a more extensive role in preparing for it and carrying it out. Much of the US claim that Assad is responsible was initially based on reports from witnesses, non-governmental groups and hours of YouTube videos. Perhaps my disappointment is conditioned by the long wars in Afghanistan and especially Iraq, the case for which was built on faulty or misrepresented ‘streams of intelligence’. I understand that this work cannot be made public fully. I have a basic trust in the US government, but I also fear the behind-the-scenes maneuvering among world and regional powers, masquerading as concern over chemical weapons. Certainly there can be misinformation and invented testimony on all sides, but the reporter for Mint Press, Dale Gavlak, writes consistently for the AP and has contributed often to Christianity Today. I have met her once and appreciate her journalism. She states, however, she did not investigate personally in Syria, but relied on a local journalist. In the end, is this much different than ‘streams of intelligence’? Yes, at least in part, for the journalist is named. Unfortunately, as seen above, not all of his sources are. But the two accounts are almost comically different. The first builds its case on the complexity of the attack, the second on the incompetence of the delivery. So what should America do? Here I will pause, for I realize that geopolitical realities are messy and our ideals, perhaps, can rarely be realized. In fact, perhaps, they must often be compromised. Among the regional powers listed above, are there any with which our ideals can rest comfortably? So shall we choose between the least bad options, using language with which President Obama has described the recommended missile strike? Or should we just stay out of someone else’s fight? If so, it is not as simple as saying we will stay out of a civil war, since so many other regional agendas are in play. Should we let them decide matters, and keep our ideals from having any influence at all? Goodness. I hope we have moral men and women in our administration making these decisions. But I fear that as long as our intervention is portrayed in ‘humanitarian’ terms, we compromise these ideals by not being fully honest. I fear a situation as in Libya, where a mandate was given to protect the people of Benghazi from Gaddafi’s anticipated assault. Not long afterwards US-supported NATO forces went far beyond their mandate to aid the rebels and facilitate the overthrow of the government, even though, reportedly, there were no ‘boots on the ground’. But tough decisions must fall to someone, and I am glad the president has involved Congress. Our intervention must now be the choice of the American people, for good or for ill.
Syrian church leaders have welcomed and endorsed the call of Pope Francis for a day of prayer and fasting for Syria on Saturday, 7th September. The Pope condemned the use of chemical weapons, along with all other forms of violence, and renewed his appeal for urgent effort towards a negotiated settlement rather than military escalation. The Pope’s call has also been welcomed by other religious leaders, including the Grand Mufti of Syria. The Syrian crisis is increasingly complex, with the chemical weapons attack of 21st August a particularly heinous example of the numerous atrocities perpetrated by a range of parties. Widespread violence between Government and various opposition groups continues, including in the major cities of Damascus, Aleppo and Homs. There are also conflicts between Kurdish groups and opposition groups as well as intra-opposition clashes. The death toll continues to rise and the number of displaced people grows ever larger. The most reliable estimates suggest that at least four million are displaced within the country and that more than two million are officially registered as refugees in neighbouring countries (many more have not officially registered). Syrian Christian leaders are appalled by the continuing violence and violations of human rights. Their consistent message is that a solution can only come through political dialogue and that all parties must prioritise the needs of the Syrian people. d. The international community will cease using Syria as a place to pursue their own agendas and act only in the best interests of the Syrian people. But simply praying is not enough for everyone. Robert Miner is a friend of ours who lived for 26 years in Jordan, working extensively with the Program for Theological Education by Extension. 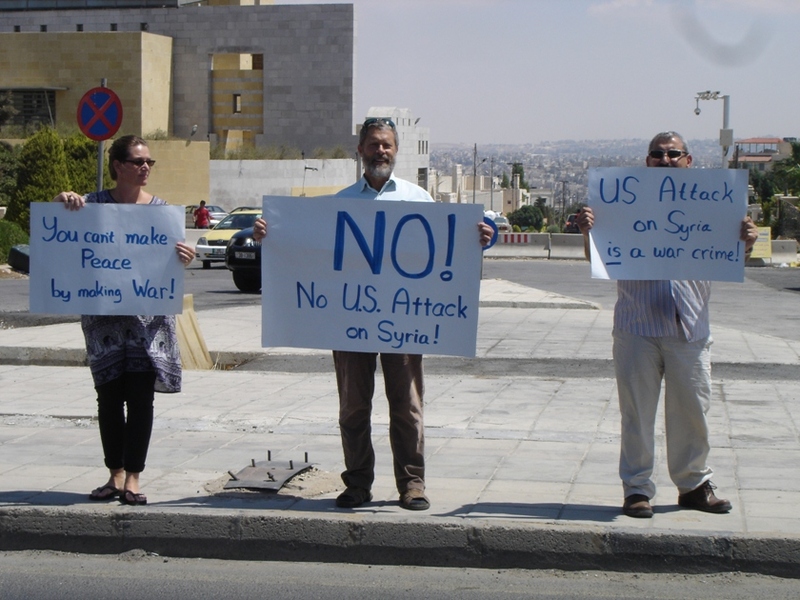 With a small number of like-minded friends, he protested the possible strike at the American Embassy in Amman. Please take note that we strongly disapprove of the proposed US attack on Syria, which is soon to be discussed in the US Congress. The cause of peace in Syria, as well as in the entire region, will in no way be furthered by an attack by the US and its allies on Syria, but will lead to further death, destruction, and the prolonged suffering of the Syrian people. We demand the US withdraw its military and denounce these threats against Syria. He also provides links to the White House, Congress, and in particular for Christians, a message of faith programed for delivery to your appropriate representatives. May God give wisdom to all in determining the right course of action, and bring peace, justice, stability, and consensus to the Syrian people. Hi. Let me first state that I am opposed to the proposed U.S. bombing campaign in Syria. I opposed the Iraq invasion too. In my circle, though, I have seen the Mint Press article referred to ad nuaseum, and I have found it wanting as a piece of evidence. Let’s just start with “many believe that certain rebels received chemical weapons…” Well, in my country, many believe that President Obama is a Muslim. Mere belief, however, does not make it so. How is this claim actually presented as evidence in the article? Also, half the article details Bandar’s involvement in funneling arms to the rebels, which he may be doing. Nowhere, though, is any evidence given that these arms included chemical weapons. I suppose, though, because of the assertion of “many people” mentioned above, that we are to assume these are part of it. In short, that half of the article actually has nothing to do with the claim made by the headline. Finally–and this is more subjective than what I’ve written so far–I find it hard to believe that a “well known rebel leader” was willing to give such an eloquent and convenient rebuttal to the conventional thinking. Why–knowing full well that Assad’s use of chemical weapons could well bring the U.S. into the fight against him–would such a leader so easily refute the evidence which would do that? Again, I am opposed to the U.S. bombing Syria. I just want Christians–and everyone in general–to oppose such actions based on real evidence. Or, even better, simply on principle. This faulty article seems like grasping at straws. Well spoken, Matt. Thank you.